But on seeing Under Secretary, a script written by Poornam in Swadesamitran, Rajamma sought his permission to enact it as a play for UAA in 1964. The play was successful, staging fifty shows, and also marked Jayalalithaa’s stage entry as the heroine. UAA was the only drama troupe she acted for and, from there, she went on to make a mark on the big screen. Rajamma impressed upon her to concentrate on her studies even while she was acting. Jayalalithaa is grateful for Rajamma’s encouragement and care; she calls her her ‘second mother’. 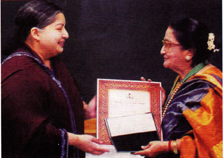 J. Jayalalithaa who has called Mrs. YGP her “second mother”. Plays were staged by UAA to raise funds for the fledgling school. In Pavam Balaraman, Rajalakshmi donned the lead male character opposite the much-acclaimed film heroine Savithri. She also presented all-women plays as fund-raisers. These were usually UAA productions and she credits Pattu with choosing the appropriate scripts for them. Despite her full-fledged involvement in the school, she was still a vibrant part of UAA. She would suggest changes even after rehearsals and the first show. In one of the Chinmaya Mission’s plays, Kamban Tharum Katchi, she donned the role of Soorpanakha, when the organisers could not find anyone to play that role. She says, “No one was willing to play that villainous character. I accepted it and it became a big hit.” Persuaded by students and teachers, she donned the role of Avvaiyar in one of the PSBB annual day celebrations much later. She has also taken to the big screen in two movies – Kathai Kathaiaam Kaaranamaam (starring YGP and Y.G. Mahendra, and directed by Y.G. Mahendra) and Rajapaarvai (starring Kamal Hasan, Madhavi and L.V. Prasad, and directed by Singeetham Srinivasa Rao) – not to mention a fleeting appearance in Tein Nilavu with Vyjayanthimala Bali, a distant cousin of YGP. Just before YGP passed away in 1991, he handed over four sealed covers to his daughter-in-law Sheela Rajendra, to be opened after his death. One cover had a message for Rajamma that she should not stop wearing the kumkumam and flowers after his death. Social causes also brought a public standing for Mrs. YGP, the name she assumed on becoming popular. In memory of Mrs. Padama Seshadri, who cherished a dream of starting her own school, Bala Bhavan was renamed Padma Seshadri Bala Bhavan in 1973, to fulfil the wishes of R.M. Seshadri, Padma‘s husband, who donated Rs. 30,000 to the school. Mrs. YGP led from the front as its Principal and later became the Dean & Director of the PSBB group of schools. The schools are a manifestation of her own firm belief in adhering to Indian tradition as a way of life while getting educated in the modern Western way. Apart from the curriculum, the schools today provide opportunities for students to pursue their cultural interests. A dramatics workshop conducted by Madras Players is run as a 24-session programme every year to encourage children develop a flair for theatre. 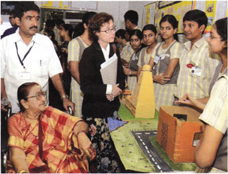 Art forms which impressed her on her visits abroad get woven into the school’s programme. She realised how little she knew about Vaishnavism and heritage when she took her two nephews from the U.S.A. to temples around Madras. This kindled her interest understanding the faith and its practices. She enrolled for a diploma course in Vaishnavism at the University of Madras, which she completed when she was 66. While on a visit to Tirukoshtiyur she was shocked to see the temple in a state of neglect. When she asked the people around why they had kept the temple in such disastrous condition, a volunteer, called Madhavan in the crowd, offered to restore the temple and eventually became part of the Mangalasasana Divyadesam Trust, which took shape on her initiative for restoring Vaishnavite temples in a state of ruin. As secretary of the trust, she mobilised resources, human and financial, to help restore 40 Vaishnavite temples across Tamil Nadu. Aghast on hearing that promising artistes had to pay to perform on stage, Mrs. YGP initiated Bharat Kalachar (Culture of India). It was inaugurated in 1987 by the doyen of Carnatic music, Semmangudi Srinivasa Iyer. The main objective of Bharat Kalachar is to encourage up-and-coming performers by providing them with a stage opportunity and also expose the students to performances of leading artistes. “Students writing a review of a performance got two marks added to their weak subject,” she says with pride. Young talented artistes who impressed her were given a stage at Bharat Kalachar. It has gone on to become one of the well known sabhas of the city.